Little Bit Funky: fun numbers. But first. Can I just say how ridiculously cute this baby is? Do you SEE those big brown eyes? It hurts me how cute he is...let's not even talk about how he just seven months and wearing a size 18 month one piece...and it fitting pretty well. Let's just focus on the cuteness...not that fact that he is growing so fast. I just recently passed 3000 sales on Etsy!!! Amazingly this doesn't include the many orders I have done on the side for friends, family or MOPS gals. I am stunned. You would think this would make me confident. It doesn't. I expect to be found out with each and every sale. I am amazed at all of the sweet repeat buyers that I have...many who have become friends. Really? You love my stuff so much that you will buy it again? And again? You crazy, silly, wonderful people. I am thankful for you. That is the number of blog hits that I have had since installing the counter. That is a crazy number. Really? That many folks who want to visit. Three years ago I had never thought of opening my own store. Two years ago I had almost never sewn. One year ago my store was still mainly cards. Six months ago I had never quilted. now it's in a local shop. Now I am wondering...what surprises does God have in store for me next? Congratulations on all the numbers! 2 years ago you almost never sewed? You lie! That gives me hope...you have no idea how much! That boy is gorgeous! He is getting so big and beautiful. I will definitely buy from you again! For my daughter this time. That robot tee that you made for my son is amazing. He loves it and has already worn it FIVE TIMES!!! And your items should be in many, many shops!!! 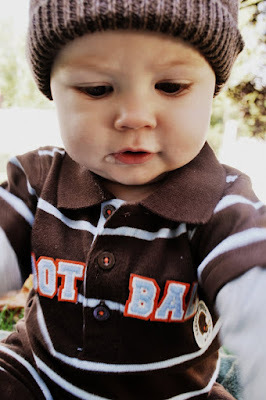 His hat is so adorable. I love it. Do you mind sharing where you got it? 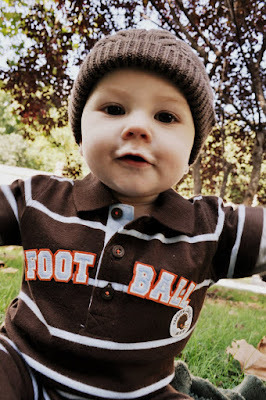 He's adorable and that brown just looks FABULOUS on him!!!! Congrats to you. You have so much to be thankful for!!! 2. 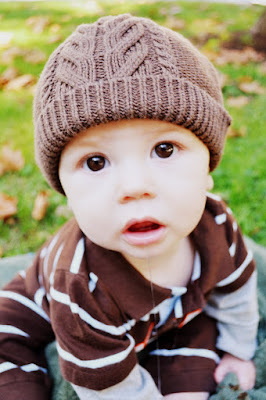 That is the cutest baby hat ever. EVER. 3. Just think of all the people out there who let fear keep them from pursuing their dreams of opening an Etsy shop. Or sitting down at a sewing machine. Or whatever. Way to put yourself out there! It has paid off!! Love those dark brown eyes! I've been wanting to open my own etsy shop for some time and you just gave me the push to take the leap! PS. I lurked along and made a quilt- I LOVE it! You greatly underestimated yourself - a habit that I think women tend to have. It's rare that I find an Etsy shop that I would buy every item from - your shop is it! I am SCARED SILLY to open my own Etsy shop -- or to start a blog for that matter. I feel as though I don't have anything worthy of selling or saying! I admire your confidence. (and I admire ALL of the items in your shop). What shop is carrying your items? How exciting for you. Congrats on ALL your success & many more to come!! I know you can do it & so do YOU!! You have proven it... just believe in yourself!! Congrats on all your achievements, especially those cute boys! Your stuff is amazing and I love following your blog... You are truly inspiring. congrats !!! I am really impressed. you do such a wonderful job !! !